For companies operating in the highly-connected global economy, digital connections with customers, suppliers and business partners are critically important. To sustain and optimize business performance, these connections must be scalable, secure and always-on. 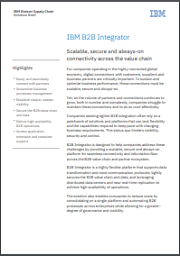 IBM’s B2B Integrator is designed to help companies address these challenges by providing a scalable, secure and always-on platform for seamless connectivity and information flow across the B2B value chain and partner ecosystem.